Over the years, I've tried my hand at creating a vegetarian matzo ball soup for Passover. Some attempts were so-so, some were pretty good, but I never really hit on one worth recording -- until now, that is. There's no powdered soup mix in this recipe -- all of the flavor comes from vegetables, herbs and spices. But the real secret to the savory vegetarian broth is the addition of mushrooms. Even if you're not a fan of mushrooms, don't skip them -- they don't make the soup taste mushroomy at all, but do add a wonderful umami quality and depth of flavor. 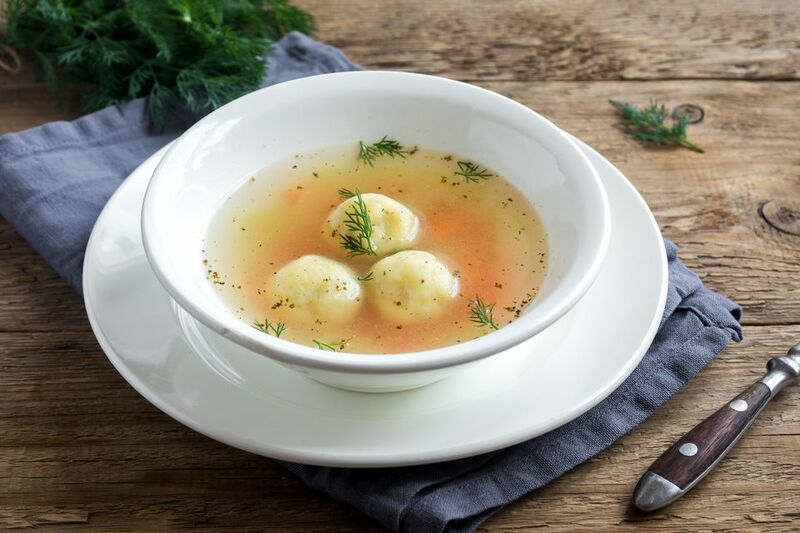 I like to serve this soup with Dill Matzo Balls, but if you've got a favorite family recipe, feel free to use that instead. Warm the oil in a large stockpot set over medium-high heat. Add the onions, carrots, celery, and parsnip, and saute, taking care not to brown the vegetables, for about 10 minutes, or until the onions are soft and translucent. Add the garlic and ginger, and sauté until fragrant, about 1 minute. Add the mushrooms, and sauté until they release their juices and soften, about 5 minutes. Add the zucchini and sauté 5 minutes more. Add the water, raise the heat, and bring to a boil. Stir in the dill, basil, and salt. Lower the heat, partially cover, and simmer gently for 30 to 45 minutes, or until the broth is golden-hued and flavorful. Alternatively, use a large slotted spoon to transfer the vegetables to a colander set over a large bowl. Whichever method you choose, gently press the vegetables in the colander with the back of a spoon to extract any remaining broth from them, and return the extra broth to the pot. If desired, spoon some of the carrots and/or parsnips back into the broth. The broth can be made 1 to 2 days in advance, and refrigerated, covered. To serve: Bring the soup to a simmer, and add the prepared matzo balls. Simmer until the soup is hot and the matzo balls are heated through. Ladle into bowls and serve. Enjoy! If you're serving major matzo ball fans, make a double batch of the dumplings. That way, you'll have plenty on hand if guests want seconds, or if you've got any leftover soup. For casual meals, or if you prefer a heartier soup, skip the straining step, and include some of the vegetables in each serving.